Ever wonder where the Subservient Chicken guys get their inspiration? Speaking on a panel this morning at the Account Planning Conference in Chicago, Benjamin Palmer, president of The Barbarian Group, revealed that he frequents the DayPop Top 40, a site that tracks links that are most popular with bloggers at any given point in time. Naturally, we scurried to our computer to see what’s high on the Top 40 today. And we found, at No. 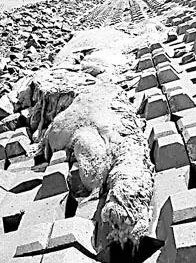 2, an intriguing tale (along with the weird and grody photo shown here) about an unidentified sea creature that washed up on shore in east China after a typhoon. What is this thing?! An enormous crocodile? An “elephant seal”? A relative of the Loch Ness Monster? No one knows. But how long will it be before we see a refreshingly daring Web site for Burger King’s Big Fish sandwich?